Should US Troops Be in Uganda? The Lords Resistance Army is as worthy a target of being wiped out as any band of murderous fanatics in the world. We can’t go after everyone, but the United States has been committed for some time to the integrity of both Uganda and the newly created South Sudan. 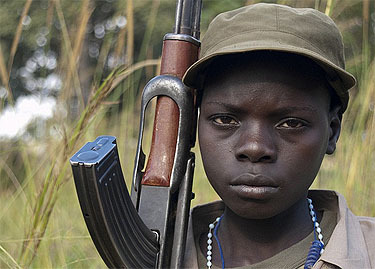 If we’re going to go after anyone, the LRA surely deserves to be near the top of the list. It’s a very small deployment. Sending a hundred trainers and advisors isn’t in the same category as a full-scale commitment of troops and U.S. military power. And with the LRA now cut off from Khartoum, there’s a realistic chance of getting rid of them for good at fairly low cost. Unlike Libya, this deployment was authorized by Congress last year in the LRA Disarmament and Northern Uganda Recovery Act. This, combined with the small scale of the operation, makes it constitutionally benign. Finally, there’s the question of whether this deployment will remain small as time goes by. On this score, I think Obama deserves the benefit of the doubt. The Libya operation may have been constitutionally suspect, but operationally Obama demonstrated that he was capable of putting limits on what the United States was willing to do and then sticking with it even under considerable pressure from our allies. And although he has escalated in Afghanistan, the escalation wasn’t a matter of caving in to pressure from the military. It came only after very detailed discussion and planning, and it was consistent with everything he had been saying about Afghanistan for the previous two years. Put this all together and I’m pretty much OK with this operation. I’d love to see the LRA cleansed from the face of the earth, and I think there’s a decent chance of being able to do it now. This mission is, obviously, being done with the cooperation of the Ugandan government, it’s small and focused, and there’s every reason to think it will remain small and focused. This is not Iraq 2.0.